Reiki meteorite is the platform for esoteric, spiritual and religious practise. Its base are meteorites and become an autistic personality obsessed by meteorites of all kinds. Reiki meteorite is taken over from japanesse tradition which is represented by Mikao Usui, Chujiro Hayashi and Hawayo Takata. The base is what remains after Mikao Usui and it is Reiki sign which is over his burrial place. Esotericists are able to perceive this object, copy it and take over it for themselves and other Reiki persons. Consecration directly from the burrial place is a unique achievement. The character which remains over the burrial place of japanesse Reiki person Hawayo Takata is copied. Takata cosecrated 22 Reiki persons and those consecrated others. Reiki character is taken over in Reiki consecration and this Reiki character may have been modified. Reiki person should always copy the sign of Hawayo Takata from her burrial place which includes mainly healing pictures and healing signs and medicinal treatments, but they don´t often do that. We could change the content of Reiki symbol taken from Takata. Inside this symbol we want images of navel, placenta, umbilical cord, pictures of pregnant mother, images of 70 000 energetic structures which are in the navel, prehistoric dwarfed structures that includes a grid system in the skin, trilobite, neural pathways in the skin, fat cells and skin alone. This includes entrance into the navel where human life starts. We plan to add there human longliving, high level of intelect, good fortune, sanity and interest about afterlife. Reiki characters over the burrial place Mikao Usui and Chujiro Hayashi could not be changed, their content is fixed and this is also benefit. Reiki characters of those two individuals are created by consecration from autistic monk who works only with meteorites. Mikao Usui had inside of himself one more unique thing and that vestigial structures of his brother and those vestigial structures were very alive. Those structures overgrown in his body. Of course do not forget about meteoric signs over samurai graves. They are perceptible for persons who have already survived early stages of the clinical death, so they are like spiritual sensibils able to penetrate to samurai grave and copy the object over the grave. We hit the uniqueness here and that is vestigial structures in the human body or their base in the form of stem cells which are inactive and could be activated by meditation. This is unique potential which has to be activate inside the human by concentration and meditation. You can have any Reiki consecration, either over the head or in the navel, but unless you don´t start to open vestigial structures by meditation, you only pretend extraordinary abilities. If you open such structures, you open the gate to extraordinary abilities and Reiki magnet is tool to open them. And did you know that persons who are naturally longliving gain this longevity by active vestigial structures in the body that become replacement of normal human organs. And so we have here two strong motivations to open those structures – become long-lived and open extraordinary abilities that lead to strong magnetism (keep objects on the own body, ability to levitate objects). Very good combination for Reiki person. We continue in Reiki meteorite and now we focus on meteorites which act as magnets able to draw on their own surface metal objects. 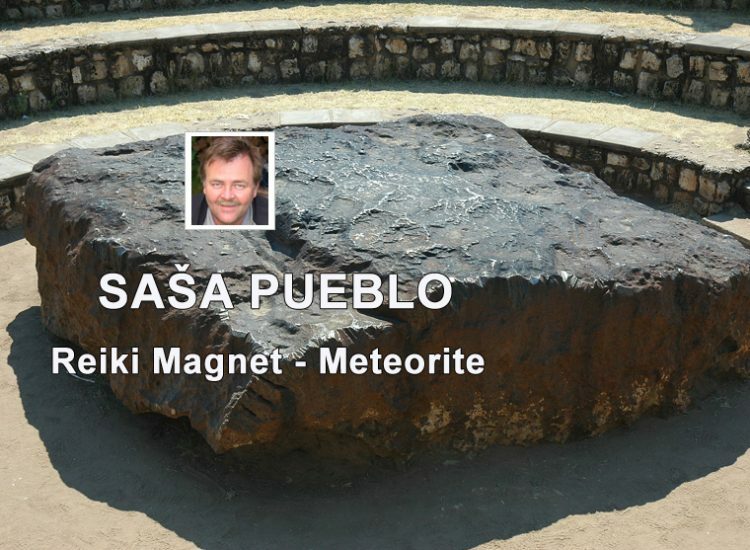 Some meteorites have inside magnetism. We choose two types of personalities and such who are able to hold metal objects on own body and such who are able to produce kind of ultrasound and and levitate small objects. You can say to yourself how this is possible that they are able to do such performances. Medical and scientific investigation, in principle, did not come upon the nature of these extraordinary abilities. So we started to examine such persons intuitively by oracular techniques on the distance. Later we started to perceive vestigiality in their bodies and extraordinary amounts of little bio power plants – mitochondrias. They are micro oranelles which change chemicals to something as one-way electric current. More mitochondria in the body cells, the stronger low electric current. And here is whole secret why somebody produce in the body abnormal amounts of bio low electric current and somebody not enough. Of course, a person who has normal levels of these organelles can reach their activation by meditation and concetration. And optionally through Reiki opens vestigial structures – vestigiality likely to contain extraordinary amounts of mitochondria. People who creates enough bioenergy, also creates magnetism, but also other phenomena as paramagnetism. Someone even in their elements open magnetism at the atomic level and this is even more powerful than ordinary magnetism. Swiss physician, grandfather of Hypnosis Franz Anton Mesmer had during the life huge amount of mitochondria and vestigial structures – vestigiality. He was devoted to the treatment of conventional magnets, he also received a special Indian magnet made of meteorite magnetite, endless threshing hammers in such meteorites naturally increase their magnetism. And so connection of magnets and mitochondrias of this man bring him some benefits. He also added hypnosis based on own magnetism. He used magnetism that can put a person into hypnosis. Consecration is about to copy objects of such individuals over their tomb place to store such copies in aura overhead. Subsequently Reiki person use them to operate in own mitochondria which are conneted together by bioenergy and begin to work simultaneously and together and now there is bio and powerful magnetism.And this is the beginning of the creation of extraordinary abilities. Mitochondrias in cells and their common coordination, bio electric current a lot of mitochondrias, mitochondria as chemical factory for production unique chemicals, Kirlian photography. Magnetism or sticky skin? Former chef is able to keep the hammer on the body. In terms of science, these people are unique only by having slightly more adhesive and more elastic skin. Magnetic Man Ostertag had a torso, arms and body with characteristics of the magnet, he could stick on yourself metal saw, spoons, ceramic tile, school chalk, charcoal, banana, soap, sausage, comb, toothbrush. Liew Thow Lin from Malaysia is know as Magnet Man, because he is able to keep metal objects in weight 2 kg, total up to 36 kg on the body but not as a result of any source of magnetism. Scientists from Malaysia University of Technology found that his skin has a very high level of friction – suction effect. Miroslaw Magola – Magnetic Man can pick up objects from various materials vertically from the ground and move them horizontally, vertically or in a circle. He realised that he has got magnetism talent when he put on his body spoons and forks. Cabral said that he can not catch metal handles while is cold weather. See how a crippled man from Bangkok uses his telekinetic movement of objects from his body and mind. Nina Kulagina – moving small objects such as a piece of sugar or a matchbox, turning arrow in the compass, touch the hand on the shoulder of another person can cause severe burns, change in acidity (pH) of water.